Sometimes, after labor and delivery, infants need help breathing on their own. When an infant needs to be resuscitated with the small oxygen mask, doctors must take extra precautions while monitoring the baby’s’ breathing. In particular, the hospital must measure the amount of carbon dioxide and oxygen in the infants’ blood. 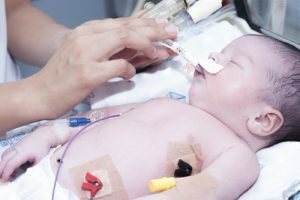 When the hospital or doctor is unable to effectively manage a baby’s breathing properly, there is a potential for birth injuries caused by medical malpractice. Babies born before 37 weeks may not have fully developed lungs. The more premature the baby, the more likely the baby will need help breathing. In addition, diabetes in the mother, delivery issues that reduce blood flow to the baby, rapid labor or delivery, and multiple babies, can also negatively impact the newborn infant’s ability to breath on its own. No matter what the cause, doctors and hospitals should be ready to help an infant breathe. Oftentimes, a small oxygen mask is all that’s needed. But serious birth injuries can occur if the doctor is negligent in monitoring the assisted breathing. Problems can stem from not paying close attention to the oxygen level or from placing too much pressure in the baby’s lungs. Once such problems occur, it is difficult to avoid a birth injury. Lifelong injuries such as cerebral palsy, hypoxic ischemic encephalopathy, periventricular leukomalacia, and retinopathy of prematurity are potential problems that can arise when breathing problems are not addressed properly. This is medical malpractice. There are many ways to treat an infant who needs help breathing – the method selected depends on the degree of the help the child needs. Nasal cannula, nasal intermittent positive pressure ventilation, and other advanced medical treatments are used to help babies recover from needing breathing assistance. Parents place their trust and confidence in the doctor’s ability to regulate their child’s breathing. If for some reason your child has suffered a debilitating injury and had breathing issues at birth, call Thurswell Law at 248-354-2222. When a doctor or hospital is negligent with your child’s breathing problems, birth injuries can occur. If you believe that the doctor that you placed your trust in could be at fault for your child’s birth injury, we will fight to make sure you receive the monetary compensation you deserve.